There has been a little delay in my movie challenge. And the reason is I had a difficult time tracking down a copy of the movie. 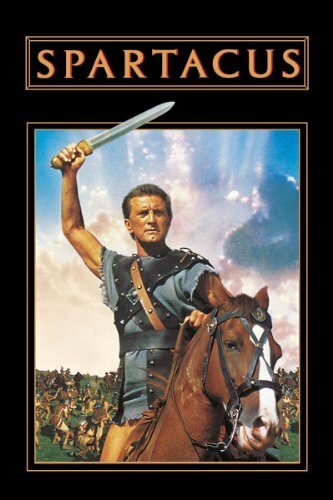 The 81st movie on the top 100 AFI list is Spartacus. After watching Sunrise, a silent film from 1927, I was surprised by my inability to find a copy of a movie made in 1960. First I tried Lovefilm.com but to no avail. Then I went to my local video stores and struck out completely. I’m not big into buying movies (I have too many books and have no room for DVDs) so I didn’t want to try that route unless I absolutely had to. Then a few weeks ago I saw it was going to be on TV. Perfect right? I wasn’t home when it was on, but I recorded it. Or I thought I did. I really started to consider skipping it. Let’s be honest, I set the rule of watching the movies in order so I could break it. But then I looked online and saw that it would be on TV again the following weekend and luckily the recording worked. After all of this work, okay it wasn’t all that much work, I finally sat down and watched the movie. Before I give my verdict, here’s a quick rundown of the plot. Spartacus (Kirk Douglas) is a slave living under Roman rule in Libya. He stops to help an older slave who has fallen down and is punished for this by a Roman soldier. Spartacus doesn’t get back to work. Instead he attacks the soldier and bites him on the ankle. He is sentenced to die by starvation for this outburst. Soon after, Lentulus Batiatus (Peter Ustinov) visits the work area in search of conscripts for his gladiatorial school. He sees potential in the feisty slave and takes him back to his school. During Spartacus’s training he falls in love with another slave. However, being a slave under Roman rule proves over and over to be a bad situation. The female slave, Varinia (Jean Simmons), is sold. Spartacus learns of this and is also fed up with how he and the other trainees are treated. He starts an uprising. Eventually he becomes a leader of escaped slaves and does his best to rock the Roman world with his band of renegades. The movie, directed by Stanley Kubrick, has a stellar cast. Kirk Douglas, Laurence Olivier, Peter Ustinov, John Gavin, Jean Simmons, Charles Laughton, and Tony Curtis are a few of the big names. It won four Academy Awards and has been on many lists for the greatest movies of all time. Yet, I wasn’t a big fan. At times I thought it was brilliant and at other times I was bored. The acting was fantastic but the story let me down. Overall, the story is decent but it just kind of rambled along and seemed pointless on occasion. The scene when the slaves proclaim “I’m Spartacus” was touching but I wished they got to that part sooner. The next movie on the list is The Apartment. I hope it is much easier to track down. If not, I have plenty of books to read. This entry was posted in Movies and tagged AFI, AFI Top 100 Movies, American Film Institute, Charles Laughton, History, Jean Simmons, John Gavin, Kirk Douglas, Laurence Olivier, Life, Movie Reviews, Peter Ustinov, Roman History, Spartacus, Stanley Kubrick, Tony Curtis. Bookmark the permalink. I haven’t watched it yet and although I’m sure I will some day, my hopes aren’t too high. Still, it’s odd it was so hard to find I know many people who like it. I always meant to watch The Apartment. That should be very good. I was really surprised. To be honest I thought I would have a harder time finding Sunrise than Spartacus. Not only does the movie have a huge following, but so does the director Kubrick. And there are some big names in the movie who still get people’s attention. I think that this is one of those movies that need to be remade. It is a film that could be made to be as powerful as 300, and Braveheart. The story has the potential. Like you I was bored when I watched this movie, and a little disappointed as I felt they did not do the theme justice. So good to know I’m not alone. I know this movie is respected and many love it and I wanted to love it. The story can be so much more. And for a movie of this scale I didn’t expect to be bored. I kept thinking about Gladiator and tried to figure out why I loved that film and didn’t love this one. Maybe I should re-watch Gladiator and see if I can pinpoint it. I know there is a TV series called Spartacus but I haven’t watched any of the episodes yet. I didn’t want to spoil the movie. I agree with you, the original had potential and maybe in the right hands it could reach it. Maybe because The Gladiator is a newer film. The newer films, I think, sweep you away with their cinematography and their succinct conversations. That could be it. But I have always loved classic movies and don’t always need the wow affect from special effects and sound. However, to be honest, these effects are fantastic in Gladiator. Also, I think the story in Gladiator is tighter and moves at a quicker pace. I think my husband has watched this—he is a big fan of Gladiator and Brave Heart and those type of movies . I, on the other hand, not such a big fan. Glad you can tick this off your list! What kind of tea goes with popcorn? I had the same impression. I liked the “I am Sparticus” part (I was waiting for it, actually), then I was compelled to look up the story in Wikepedia. 😉 How about “Gladiator”? Now There’s an amazing movie! I do love Gladiator. That has it all, great acting, story, action, and crazy families…you can’t go wrong with that formula. I’m glad you like the movie Nia…I love re-watching films that speak to me and it sounds like you really like this one. I have to agree with Colline – I think it should be remade, with ummmmm…say…Gerard Butler in the lead! 😉 I haven’t watched it yet, but it sounds like it might be worthwhile to try and see. It is worthwhile to see at least once. I was just surprised because I expected more about the story. I love classic movies…there is just something special about them. When I was younger I didn’t watch many of these types of films, but lately I’ve been catching them when they are on TV and I am liking them. Is there one you suggest I watch? Ooh, The Apartment! I saw that not too long ago on TCM. Shirley MacLaine and Jack Lemmon – a great combination. Jason Reitman recently reimagined it as a live performance. A “reading” of the original screenplay. The LA performance had Steve Carrell and Natalie Portman. The NYC performance had Paul Rudd and Emma Stone. I wish I could have seen it, but it was a really limited run. Can’t wait to hear what you think of the movie. That is a shame you missed the live performances. That would have been pretty cool. I’m excited to watch the movie. I’m a huge fan of classics and I still watch TCM all of the time. I was happy to see they have the channel in London. I think I’ve seen this movie. I have a very vague recollection – but it would have been a long time ago. I understand…I have a hard time remembering movies I saw last year. And this movie came out many years ago. I haven’t seen this film yet, and honestly, it doesn’t appeal much to me. Haha. And seeing your review solidifies my intention of not including it in my to-be-seen films. I have a feeling I would sleep through the entire thing. If it doesn’t appeal to you I don’t think you will like it much. I could be totally wrong, but I have a feeling that you won’t be all that thrilled with the slowness. It’s a film that is burdened with being way too long. I watched it last fall and had to break it into two pieces, which is something I hate doing. I think you’ll enjoy The Apartment, though. Hope you can find a copy! I wish I had watched it in smaller chunks since that might have helped. Like I said, some of it is great and at other times my mind was wandering. I thought it would be an epic film and it let me down somewhat. I’m looking forward to the apartment. Thanks Andy!